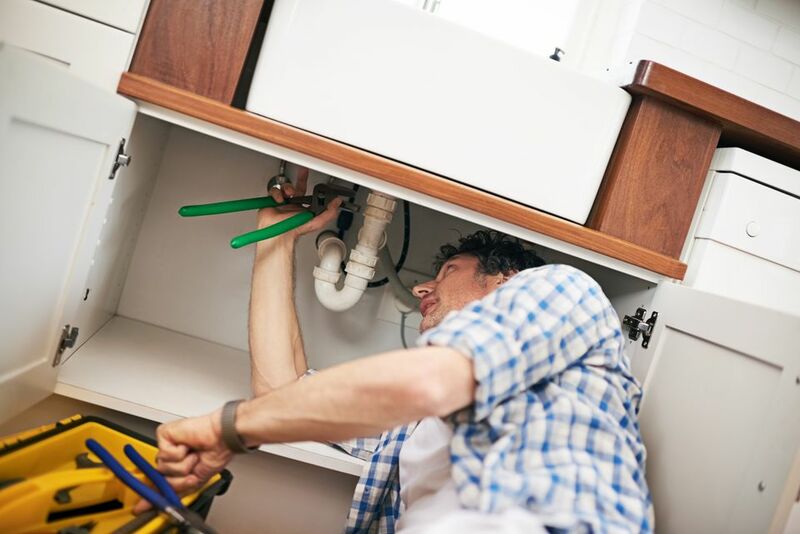 It's tempting to call your local plumber when kitchen sink is stopped up with dirty dishwater, but before spending the money, you should know that it's almost always a rather easy fix. In most cases, it takes just a few minutes and requires tools you probably already have on hand. First, try to clear the drain using a rubber cup-style plunger. Empty all but 1 to 2" of water in the sink. Place the cup of the plunger over the drain opening and pump up and down rapidly several times. Quickly pull the plunger off the drain opening. There is a good chance that this simple action may have dislodged whatever was clogging the drain. If it does, then run clear water for a couple of minutes to flush debris down into the main drain. If the clog remains, then move to the next step. If the clog remains, you will now disassemble the drain trap under the sink. Begin by sponging out as much of the water in the sink as you can. Place a bucket or other container under the trap to catch water. Examine the parts of the drain. The large knurled nuts around the drain pipes are what you'll be loosening to detach the drain trap parts. The drain trap is the J-shaped piece of pipe the connect the tailpiece of the sink drain. Because of the sharp bend in the trap, it is by far the most common place for drain clogs to occur. You may be able to loosen the slip nuts holding the trap to the tailpiece and trap arm by hand. If the slip nuts can be moved by hand, then unscrew them completely. If the nuts can't be moved by hand, use channel-type pliers to loosen the slip nuts. Pull the trap straight down and drain the contents into your container. If you have emptied the sink completely, there should not be much water or mess falling when you remove the trap. The trap is the most likely location of the clog so examine it carefully for debris. You can use a toothbrush or other small utility brush to clean it, or you can flush it with water at another sink. If there was a noticeable clog here, you will need to go no further and can reassemble the drain trap now. If there is no sign of clog in the trap, you will need to pursue your investigation further into the next pieces of the drain assembly. The trap arm is the horizontal pipe with the curved end that runs into the branch drain in the wall. This is another possible location for a clog, so now you need to loosen the slip nut that secures the arm into the branch drain. Extract the trap arm to examine it for clogs and remove any debris you find. If a noticeable clog was found here, you need look no further. The two-part waste pipe is the horizontal pipe that connects two sink basins or the garbage disposal to the drain trap. There are two slip nuts holding it in place; unscrew them and remove the pipe. Examine it for clogs and remove any debris you find. If none of these locations has produced the clog, it's possible your clog lies in the branch drain behind the wall. This is a little more serious problem, though you may be able to fix this yourself, too, by using a drain snake. After you’ve checked all parts and removed any clogs, you can put them back in reverse order. All the slip nuts should be hand-tightened first. Then, use channel-type pliers to give them a tighter seal (about 1/8 of a turn). Do not overtighten. Turn on the water to verify that the drain is clear and draining. Flush plenty of water through the drain. Check for leaks. If the drain parts leak at all, slightly tighten the joints again with pliers another 1/8 turn. Drain pipes are not under pressure, so it should not be necessary to tighten the slip nuts too far. Place the stopper in the sink and fill it with water. Release the stopper and watch beneath the sink to verify that the drain joints are not leaking. If you clog remains after your work on the drain trap, then your clog is deeper in the drain system and you'll need to use a drain snake or call a plumber. But 9 times out of 10, you will have cleared the drain clog yourself.